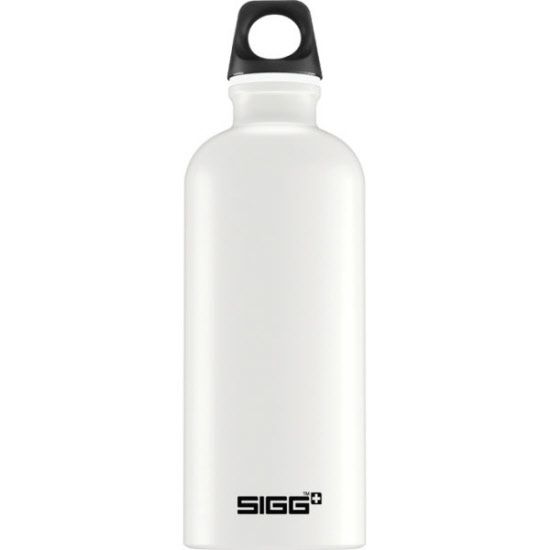 Classic White SIGG bottle with screw top.The modern classic with regards to functionality and design. What is your favorite color? It all started with a simple hiker’s bottle. Today, the SIGG bottle has acquired cult status. What happened is a success story that started in Biel in 1908. Küng, Sigg & Cie. manufactured leisure goods, kitchenware and electrical appliances. The company relocated to Frauenfeld in 1916, where it helped pioneer the legendary tradition of Swiss quality. Since 1998, SIGG has concentrated on its core business: drinking bottles that deliver ultimate customer benefit. SIGG now has what many covet: a famous brand. We always aim to be that little bit better. And it is that which has made us what we are today: number 1 – and recognised even by New York’s Museum of Modern Art. SIGG, the brand leader for comprehensive, high-quality drinking systems for leisure and sports use. • Before using for the first time, wash the bottle, seal and drinking cap. • Use only with ready-to-drink beverages. • Suitable for fruit juices and isotonic drinks. • When using with carbonated drinks, avoid unnecessary shaking and take care when opening. • Caution: alcoholic, fermented or nutrient-rich beverages may cause excessive pressure to build up inside the bottle. • Do not use for long-term storage – contents should be consumed relatively rapidly. • Fill bottle to no more than 3 cm/1¼ in. below the rim. • Do not use for non-drinkable substances, e.g. liquid fuels or other flammable, corrosive or chemical substances. • Not suitable for the microwave (risk of explosion), for cooking or for deep freezing. • Bottle can be placed in the refrigerator. • Children should only be allowed to drink from bottles with a drinking cap. Always check that the drinking cap is firmly in place. • Take care when using with hot drinks (risk of burning). • Aluminium is 100% recyclable. • Remove cap and wash both cap and bottle well after each use. The bottle and drinking cap should be thoroughly cleaned by hand in hot water, using a SIGG cleaning product or regular dishwashing liquid. Allow to dry completely before reassembling. Remove drinking cap regularly when not in use. Dishwasher cleaning not recommended. • Do not clean with steel wool, a stiff brush or an abrasive as these may damage the bottle‘s interior coating.